You'll be £12.00 closer to your next £10.00 credit when you purchase Struggle and Suffrage in Halifax. What's this? Between 1800 and 1950 the town of Halifax grew beyond recognition. The booming mills and factories were built on the labour of women and their children, and yet their voices are almost completely missing from the history books. For the first time, this is the story of Halifax from the point of view of the women who helped shape the town. This was a period of extraordinary change, but the battle for equality was long. In 1800, many women were illiterate. By 1900, there was a thriving girls' high school in Halifax, and yet one of its most brilliant students was denied a full degree because she was a woman. In 1939, the Vicar of Halifax called women's economic independence "an evil". Families were large and women regularly died in childbirth. Many faced the stigma of single parenthood or else the terror of an illegal abortion. In the 1930s, the first Family Planning Clinic was set up by women in the town. In the 1840s, women in Halifax fought for their menfolk's right to vote. In 1911, when Emmeline Pankhurst gave a stirring speech at the Mechanics' Institute, women had yet to be granted a vote of their own, leading many women to boycott that year's census and at least two to declare their occupation as "slave". 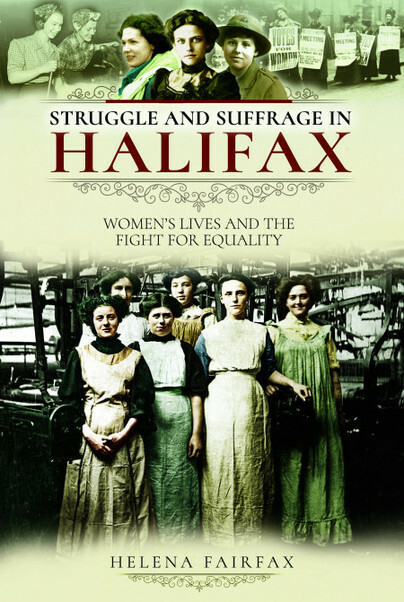 From girls in the factories to the first women stepping into public office, this book provides a fascinating and moving account of the lives of Halifax's women through the key events in the town's history. Overall, it’s a marvellous little book regardless of where you are from and highlights some important sources and issues that I feel need to be heard. It was wonderful to have the chance to hear what these brave and marvellous women from Halifax had to say but until now never had the voice to do so. Helena Fairfax is an editor and author of women's fiction. Her novels have been shortlisted for several awards, including the Exeter Novel Prize. Helena previously worked for many years in the manufacturing and textile industries, and she is particularly interested in the unrecorded lives of the women who worked these mills before her. Helena is a member of the Society of Authors and the Society for Editors and Proofreaders. Further information and articles can be found at her website www.helenafairfax.com.